In May 2013 I joined Instagram. Every blogger I knew used it, but I was very undecided how to start as I didn’t want to share a lot of personal photos or images of dolls. Instead, I decided to challenge myself to pick a bouquet of wildflowers every day, take a photo, write down what species of flowers I had picked and post it on Instagram. The weeks passed and picking flowers became my daily routine. Summer came and summer went and I was still picking bouquets on my walks through the meadows, fields and forests. On the 31st of October I decided that it was time for a winter break and by then quite a few people had started to follow me on my daily flower walks. In 2014 I continued with my series, I began at the start of May and finished the project at the end of October. A lot of people were inspired to join me and began to contribute daily bouquets under the hashtag #onebouquetperday on Instagram. I continued the project in the following years, every day without exception, again from the beginning of May until the end of October, 184 bouquets per season. I take all my flower photos myself with the help of a tripod and a Nikon D7200. Experimenting with shadows and light and with colours and textures is something I really enjoy and I am learning more and more about how to use my camera with every photo I take. Each photo is shot the very same day I post it, each bouquet reflects the mood of the day. 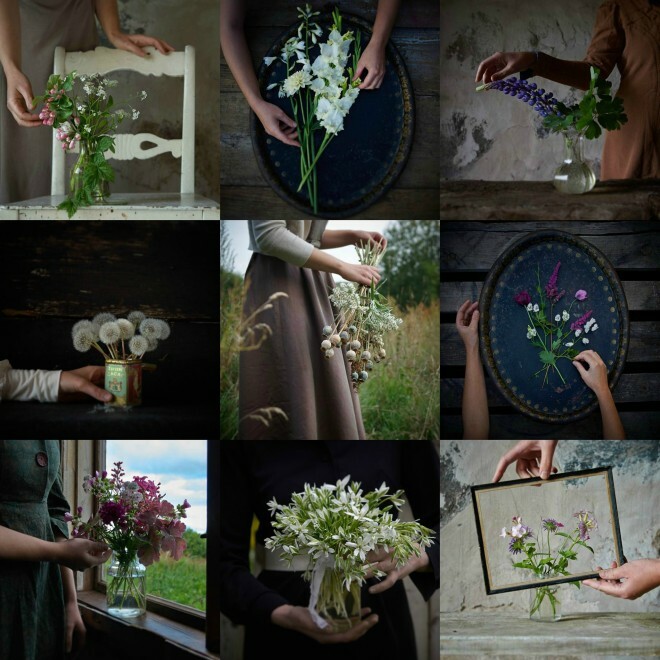 Preproducing images days ahead would be contrary to the underlying idea of this project – picking flowers on a daily basis is part of my creative routine. To take a walk, even if only for ten minutes, every day, in all weathers, keeps me in tune with myself and with nature and allows me to find my pace again. It soothes my mind and helps me to stay creative. The seventh season of the #onebouquetperday project will start on Instagram in May 2019.